When I first tried this in the workbook I found it very hard indeed. Then yesterday I was watching the play of shadows from the rowan tree on the wall in our bedroom and something shifted and clicked. An ‘aha moment’ I suppose but not a verbal one. I dived off to grab a sketch pad and when I got back- gone! The sun had shifted too! 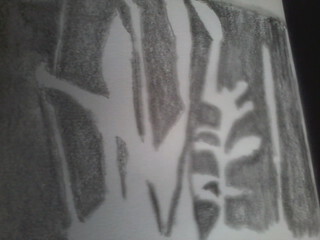 I tried to capture something of what I’d learned by drawing the negative spaces in the plants of the bedroom terrarium. When you do the workbook version of this exercise you use a cunning trick to help you. The book comes with a sheet of acetate in a cardboard frame. It’s a bit flimsy so you really have to put more card behind it. Once you have this you place it in front of the thing you are going to draw and trace the basic outlines on with a dry wipe pen. 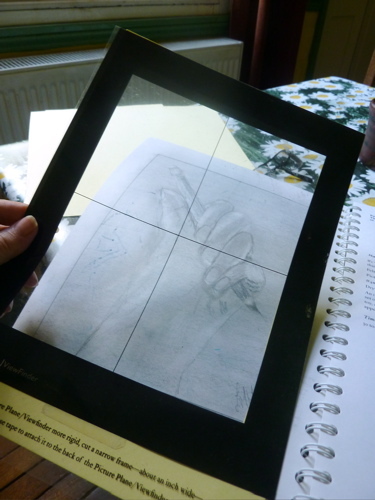 Once you have your basic outline you use the guidelines to help you transfer it to paper. The pages in the book already have printed guidelines so that makes it fairly straightforward. The outline on the acetate can be quickly wiped off with a bit of kitchen towel. I used this method for the hand I blogged the other day and for some of the other suggestions in the book but I got really stuck when I got to the negative space bit. I just couldn’t seem to get my head round it. Oh, right, another ‘aha’ I was like this about the optical illusion too. These must be related to my way of seeing, maybe even to my mild dyslexia. Doh! Hand holding an object. Less successful than the simple hand but still better than I expected. There are a few of us on the 30 Minutes 30 Days Creativity Challenge Facebook group who are going to work through the exercises in this book each Sunday. A couple of creative bits today. The hand was a Drawing on the Right side of the Brain exercise that I finally finished. The watercolour is from my journal, might be an eye or the tail of a mermaid? I enjoyed making it anyway 🙂 The sketch of Andy is just from a scrap of notepaper. I did it the other day and I was quite pleased he actually recognised himself! For the 30 Minutes 30 Days Creativity Challenge. This is days 11 and 12 I think 🙂 I’m not being too picky about it. When I was a kid staying at my Nana’s house for the summer, often a load of my cousins would be staying too. Sometimes 4 generations of the family were all there together. My grandparents had 12 children, my Mum was the next to youngest, so I have 32 full cousins and quite a few second cousins too! With all the aunts and uncles that adds up to quite a houseful. There were a lot of us! On hot days we’d all pile into various uncles’ cars and head for The Beach. There was sand, and sea, and rocks for rock pooling. There were even great places to explore when the tide was out, like The Needles Eye, The Boggie Hole, and Piper’s Cove. There were adders on the rocks and dangerous tides that could trap you. Every year my Nana warned us of the terrible agonised death suffered by some poor wee girl who’d trodden on an adder or the group of children who’d been caught the wrong side of the beach as the tide came in and been “…drooned, deid, aye, it’s a sair fecht.” My Nana had a host of these stories to cover just about any situation and she told them with spine chilling relish! These warnings ringing in our ears, the uncles would revert to being ‘the boys’ and take us kids out and round the rocks as the tide went out. Only sissies might be scared by Nana’s stories and prefer to stay safe behind and that, of course, was unthinkable! I trusted them to make sure we got back safe with time to spare. In later years I occasionally tried to stay behind with a book but was always chased off by my aunties. These expeditions gave ‘the lassies’ time to stop being our mothers, revert to sisterhood, sunbathe, fight and gossip without being overheard. There were men fishing for salmon with nets strung out into the sea. There was one ice cream van where, if you were prepared to queue for long enough you could get a Mivi. This is ‘the beach’ the one where I nearly got sunstroke, the one with a fresh water spring whose water tasted better than lemonade. The. Beach. All others since are judged against it and very few stand the comparison! 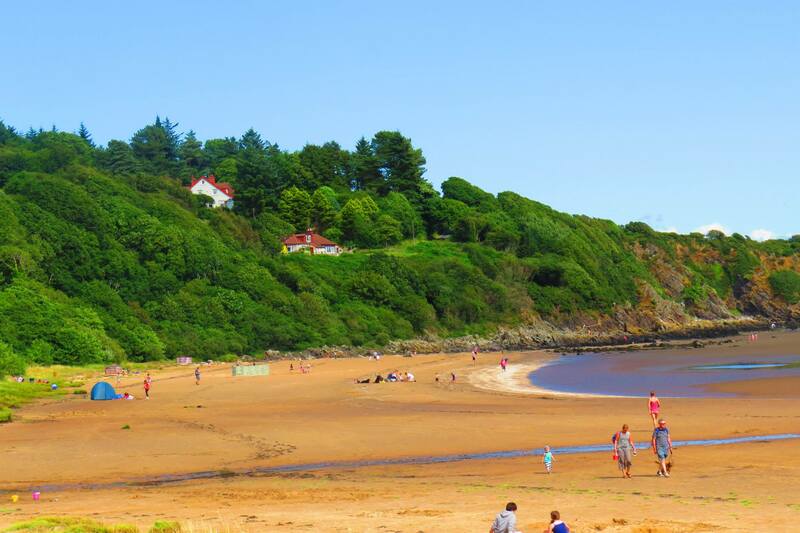 The photo is of the beach at Sandyhills. They have a lovely Facebook page, do give them a Like if you enjoy beach photos, red squirrels, badgers or you just remember your ‘beach’. So where was yours anyway? Today’s Drawing on the Right Side of the Brain exercise is pure contour drawing. You are supposed to draw without looking at the paper. To make it force your brain function to switch into visual mode you have to draw something fairly abstract, like the lines on the palm of your cupped hand. It really is all about the process as the end result is indecipherable! So I sort of did it, 5 minutes with a timer, and it was far more difficult than I could ever have imagined. The first time I was sure I’d drawn everything there was to see, so I stopped and checked the timer. Maybe it wasn’t working, er, no, I’d only lasted about one minute. Then I tried again. I managed about 3 minutes and I never did get to the stage of finding the tangle of lines interesting in themselves that’s supposed to happen. I’m going to have to keep working at this one. I’m blaming a summer cold! I guess that leaves around 25 minutes of creativity to catch up on! I’ll get to that later! For the 30 Minutes 30 Days Creativity Challenge Why not join us on the 30 Minutes 30 Days Creativity Challenge Facebook group ?